Like what you see and want to learn more? Visit my business page! The Garden- Grow, grow, grow! It has been a while since I have written a blog post here, so I thought I would give an update on one of the things we have been up to here. Specifically, the garden! There has been some success, and I have also learned some lessons for next year. A. When starting seeds indoors (I started them in the greenhouse) use a decent potting soil or seed starter. I figured I might get away with starting seeds in the soil from the yard- nope. Our soil is fine for established plants but it does not provide good enough drainage while also maintaining moisture for fragile seeds. Some seeds came up, most did not. What did come up we put out into the raised beds or left in pots, and for the most part I planted seeds straight into the raised beds. Some stuff grew just fine, some never came up. B. Pay attention to WHEN things should be planted. I should have planted romaine lettuce, spring mix, and spinach much earlier for example. If planted too late, or in enough heat, it tends to go to seed and taste bitter. I planted other stuff at the right time, but since I wasn't working with established seedlings or plants, not everything worked out. C. Pick fruit in the morning before the sun can hit it. It will retain more sweetness. (Chris told me this, I didn't know beforehand.) 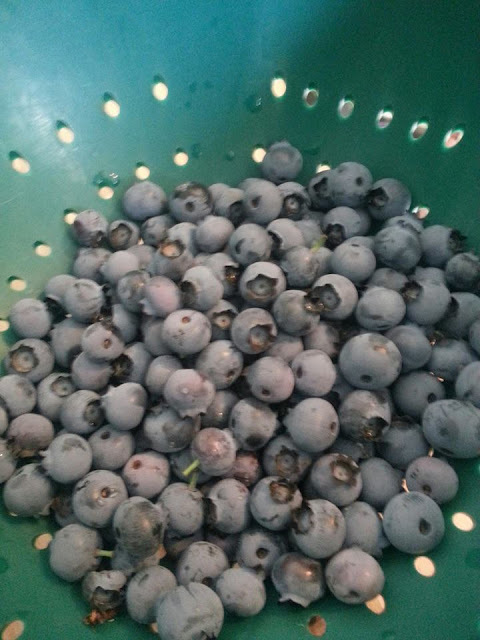 Our blueberry bushes are producing well- we have three varieties that produce ripe fruit at different times during the summer. Yum! From the reading I have done, I know blueberries enjoy acidic soil (living next to a pine tree might be helping us, then.) We also netted our bushes once the flowers had been pollinated and we saw fruit forming, to keep the birds from eating all our fruit. D. Accept that you may have an abundance of some things, and none of other things. My Russian kale, dinosaur kale, zucchini, arugula and sugar snap peas are thriving. I can't even keep up with them. My tomatoes on the other hand, have been taking a beating with the constant rain we had for a while, and now the heat and humidity. From the looks of my puny plants, I might not get much fruit from them. My zucchini pretty much took over the raised bed it is in, and I doubt I will get the eggplant or cucumber I had planted there. I planted carrots, and the greens are getting tall, so the carrots underneath the soil must be doing ok. And pretty much none of the herbs I planted worked out. Bummer- I really wanted a good basil crop to make and store pesto. So, yea I learned some lessons and will definitely be changing my approach on certain things next year. But I am still happy with the garden- I am getting SOME stuff and it cuts down on having to buy those things at the store. And now for some pictures! We typically get about a pint of blueberries at a time, once a week. So I am still going to be picking my own at nearby farms, because we can eat WAY more than that. 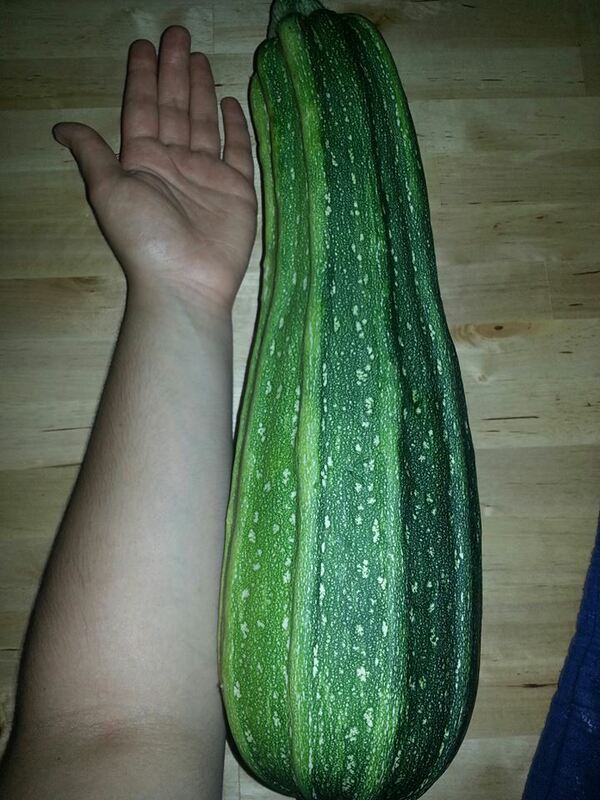 Our first zucchini, and it is mammoth. As is the plant that it was hiding under, which is why it got so big. I had no idea it was there, and Chris brought it in, like, "uhhh, looks like you need to start making zucchini bread." A recent harvest. We get so much kale, I can barely keep up. It goes into all my green smoothies. 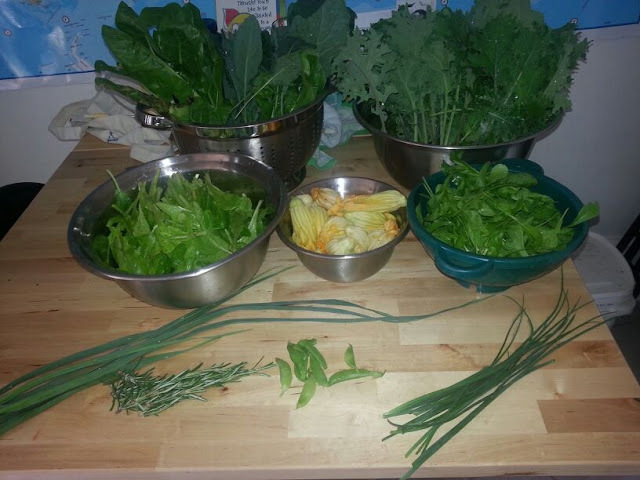 Left to right, back to front: Swiss chard, dinosaur kale, russian kale, romaine, zucchini flowers, arugula, garlic scapes, rosemary, sugar snap peas (this was the beginning for them so there was not much) and chives. First thing's first: toothbrushes. I have a Braun Oral-B Sonic Professional Electric Toothbrush, although I don't think my particular model is made anymore. However, here is a current model of the same brush. Most dentists will tell you electric toothbrushes do a much better, more thorough job of cleaning your teeth. Yes, it is expensive, but mine is over 3 years old and going strong. And you can share your brush with the rest of the family (using different brush heads, of course!) I use mine 2-3 times a day- it is like a massage for the gums, aside from really scrubbing your teeth. This is one of the toothpastes I buy. I try to stick to flouride-free toothpastes because flouride can actually be very toxic in high doses. Water is already fluoridated (ours is anyway), and here are other sources. When water was first flouridated, no dental products contained flouride and people were much less exposed. Toxicity is much more likely now. Flossing es muy importante. I will admit, I do not floss as much as I should. I really should do it nightly, but I am happy with myself if I get it done a few times a week. This is a good natural option. I have always scrubbed my tongue when I brush my teeth- I just use my toothbrush to do it. I am going to buy this thing-ama-gig though, and see if it works any better. I used to whiten my teeth- I would use those strips or bleaching trays. But they are terrible for your teeth, and can eat the enamel away. So instead, I started doing oil pulling when I feel like I need a whitening boost. If you have never heard of oil pulling, read this. It may sound a bit... crunchy or hippy-dippy, but I really think it works. I use this oil. On an empty stomach, I swish in my mouth about 2-3 spoonfuls of oil for 20 minutes. It is not vigorous swishing- your mouth would get too tired. After the 20 minutes, I spit it all out. Then I rinse with water mixed with salt (sea salt or Himalayan crystal salt.) Lastly, I brush as usual, but I use a separate (regular) toothbrush. So that's it. I don't use Listerine or mouthwash in general, for the most part. The natural ones are kind of pricey, and I don't think the benefits last long enough. Sometimes I wash with salt water as it is cleansing, but it's not a regular thing. What is your dental regimen? Any favorite products? Since I gave my skincare musts, I thought I might as well give my hair care musts. Now, I have naturally curly hair and I accept it as is. I never straighten it- so this list is geared to someone with a similar hair profile. I only wash my hair 2 or 3 times a week. People sometimes think that is gross, but the curlier the hair, the less frequently it should be washed. When I do wash it, I choose a super moisturizing shampoo and conditioner. I have tried lots of brands, some more natural than others. My current long-time favorite is Carol's Daughter Monoi- both the shampoo and conditioner. Carol's Daughter also makes a great hair masque, split end treatment, and hair oil for deep moisturization. If I treat my hair well enough and get the best haircut I can afford, I don't need to go to the salon more than 2 times a year, 3 at the most. At home, I use only Ouidad for styling. It is not at all natural, but it provides the best hold and shine of anything I have tried, without leaving hair stiff or sticky. I start off with Botanical Boost as a light leave-in conditioner that won't weigh hair down. Their Tress Effects gel provides the strongest hold, Climate Control is less strong but provides good frizz control. The one with the weakest hold is Moisture Lock gel-creme. I usually air dry, but if I am in a hurry or want to look a little better than usual, I use a hood dryer. It doesn't blow my hair around, so there is much less frizz than if I were to use a hand held dryer. If my hair is a little too stiff (if I used a bit too much gel...) I use Ouidad Pomade. It literally only takes a dime-sized drop, and it leaves your whole head soft and shiny. Use anymore than necessary and you will be greasy, though. What is your hair type? How do you cleanse, treat and style it? What are your favorite products? Do you sacrifice when it comes to natural ingredients versus efficacy? I just want to take the best care of my skin I can so that it looks its youngest. I have come up with key factors to accomplish that, but the most obvious way, in my opinion, to affect the state of one's skin is through diet. I aim to make the bulk of what I eat fresh, raw fruits and vegetables- smoothies, salads, juices, and whole fruit. My facial cleanser products vary depending on my mood, time, the weather, and the time of year. The one thing that is constant is actually a device- the Clarisonic. Yes, it IS pricey. But as I tell every person who asks about it when they see it in my bathroom, it IS worth it. It minimizes pores, sloughs away dead skin, cleans the skin better than any cleanser alone will, and allows serums and moisturizers to penetrate the skin rather than sit on top of it and clog pores. I also use the body brush head- it is great for dry patches on knees, elbows, back, etc, and for exfoliating prior to shaving. I have had mine for over three years now- it was a Christmas gift- and I still love it. If it broke, I would replace it, without a doubt. It is constantly recommended by dermatologists, makeup artists and celebrities whose job it is to look flawless. Now the cleansers that are sold with the system or in addition to it, on the other hand, I do not use. I tried them when I first got the Clarisonic, but since then, I have found cleansers I prefer. Note- since the brush is doing so much exfoliation, when using the brush I do not use cleansers with beads, salts, etc- only smooth cleansers. Lush- I am a true Lushie. I have tried every single one of the facial cleansers. I know which are best for which skin issues I am having at the moment, and I also have favorites when it comes to regular maintenance. The Ocean Salt Cleanser is great for body, but too harsh for the face in my opinion. Ultrabland is the best for removing makeup gently, and is also a great nighttime cleanser in the winter if you get dry, tight, itchy skin when the temperature and humidity drop. Aqua Marina is wonderful if skin is sensitive or reacting to something you have applied to it. I like Coalface in the summer if it is really humid and my skin gets too oily. Angels on Bare Skin is a great all-around cleanser. This is where you can order their cleansers online, or find a location near you. I love face masques- I think of them as a little treat. It's ten minutes of "me time" twice a week and they make you look refreshed and more awake. In the winter, the Lush masques I use are all about moisturizing and tightening tired skin- Oatifix, Ayesha, and The Sacred Truth. In the summer, I use masques that are cleansing and will combat impurities- Brazened Honey and Cosmetic Warrior. Find all the Lush face masques here. Here is another masque I recommend, by Arbonne. It is detoxifying and cleansing and will leave you looking radiant and glowing. Serums are another way to treat skin and take control of problems or issues- whether they be age/dark/sun spots, uneven color, dullness, wrinkles, or fine lines. I have seen excellent results all around with Lush's Full of Grace serum, which I only use at night. Another serum I highly recommend is by Arbonne. It is pricey, but their products are very concentrated- a little goes a long way and the bottle will last you forever. Spritzing your face with a toner prior to applying any creams will help them spread and penetrate the skin better, and you will use less product in the long run. Again, Lush makes a great one, Eau Roma Water. Or you can make your own with these recipes. As far as moisturizers go, Lush's Gorgeous is by far the best, but it is pricey. Enzymion is wonderful in the summer for keeping your skin glowing, but keeping the oil slick at bay. Skin's Shangri La and Imperialis are my favorites for winter dryness. See all their moisturizers here. Arbonne also makes great moisturizers, both for night and day. I drink a lot of water. I know a lot of people don't take a sip until they actually feel thirst, but not me. I go almost everywhere with a bottle of water, usually more, and I always have a bottle or two by my bed. I drink 40 ounces upon waking to re-hydrate and flush my system. I try to avoid plastic at all costs because of the chemicals it leaches. I don't usually drink bottled water because of the cost, but I make exceptions if we are out to eat- I really like Pellegrino once in a great while. My reusable bottle of choice is glass, but remarkably sturdy. I have a few of these Life Factory ones- I think they are worth the price, as high as it is. They never break- and mine get tossed around a lot. The silicone sleeve makes them easy to grip, even if the bottle is sweating. And the ring top make it so that they can hooked onto a backpack while hiking. This model has a flip top, so they are perfect when you are driving, biking, or otherwise on the move. This is one area I admit I need to work on. Lately I have become a night owl. Once the kids are in bed (around 8pm) I like to take advantage of the house being quiet. I can work on the blog, come up with recipes for my upcoming e-book, read, watch movies and shows on Netflix... But it has kind of gotten out of hand- sometimes I stay up until 2 in the morning, and I have to get up around 7 am. Needless to say, it is starting to take its toll- I have become grumpy, sleepy, and my skin and eyes look dull droopy and dull. (Basically I'm turning into the seven dwarfs.) So, I am resolving to change this and get to bed by 11 pm every night, no exceptions. Another problem I used to have but I've since improved on is cleaning/treating/moisturizing before bed, without fail. I was noticing the day after going to bed without washing my face, I would break out or at the very least I would have very dull, dry skin. So now I just try to remind myself of that. Plus, I bought some of these Yes to Blueberries facial wipes. In a pinch, they do a pretty good job of removing makeup, cleansing gently and they very lightly moisturize. If I'm really so tired that I would rather go to bed with a dirty face than take the time to go through my process, I allow myself to use the wipes, although nothing beats a true cleanser and the Clarisonic in my book. I keep my body skincare a bit more simple. I use the body brush on the Clarisonic, as mentioned above. I use bar soap because I feel it is more environmentally friendly (less packaging) but I choose certain brands because they are less harsh than say, Lever 2000 or Irish Spring. A good all around one is Dr. Bronners. If you are feeling indulgent, Lush makes amazing bath bombs, bath melts, body butters, lotions, and massage bars. I also sometimes use some of the face masques listed above if I have some I need to use before it goes bad. And for when I don't have any Lush body lotion or cream, I use Everyday Coconut- it's pretty close to natural, and it leaves skin soft and moisturized but not oily. What are your skincare musts? Save time and money and have supplies delivered! Grocery shopping is getting more and more expensive for us. Food prices just go up and up. As our kids grow their appetites grow, too. And then there is the process of getting it all from the store to the house and onto our shelves and into our refrigerator. With two kids in tow, one who cannot walk yet, it almost becomes an all day event, depending on how many grocery stores I need to go to in order to get everything we use. So in order to save time, money, and effort I am now buying some things online. Most of our grocery bill is fresh produce, so I like to see it for myself and choose the best quality. But things that are non-perishable or that are at least shelf stable, I do not need to inspect so closely. Plus, Amazon has a subscribe-and-save option on some of their offerings, so you can have some of your supplies delivered automatically on a regular basis. For example, I do a lot of baking, and go through A LOT of bread and pastry flour. Not having to lug it home on top of everything else helps. 1. The less we go into the grocery store for these things, the less we are tempted to buy stuff not on the list. 2. This is mostly stuff not grown locally, so we are cutting out the middle man and some of the transport involved. We are also saving money we can put towards food that IS grown locally. I thought if I am going to save so much time, money, and effort, maybe others would want to as well. So here are links to the items I am going to start ordering online. Some are subscribe-and-save items, some are not. Interested in having advertising, having me review a product, or doing a giveaway here? Excellent Organic Raw Vegan Chocolate! Kristen Suzanne's RAW VEGAN recipe books! I am a wife, mother to two toddlers, and an Independent Mary Kay Beauty Consultant. Interested in advertising, doing a giveaway, or having me review your product here?